Growing up in Southern California, my list of comfort foods doesn’t consist of the American classics like mac n’ cheese, fried chicken, or chicken pot pie. What really makes me feel like I am home is homemade Mexican food. Dishes like chile rellenos, tacos, empinadas and tamales are things that I crave constantly. I remember every Christmas we would get bags and bags of homemade tamales from our friends, sit around our living room table telling stories laughing and eating until our stomachs hurt. When I eat tamales I instantly smile as I am transported back to those times. To be honest, I have yet to meet a tamale I don’t like. The thing I love most about tamales is the versatility of them. The options are limitless, and the element of surprise when cracking into one always excites me. I never know if I am going to get a green chili corn, pollo asado, or carnitas tamale, I just grab whatever is closest and dig in. I have even had my fair share of sweet tamales. Sweet tamales are INCREDIBLE. The subtle sweetness of the corn is elevated by things like dark chocolate, bananas, caramel, berries, cinnamon and sugar. Again, the options are endless. The key to a great tamale is the dough. 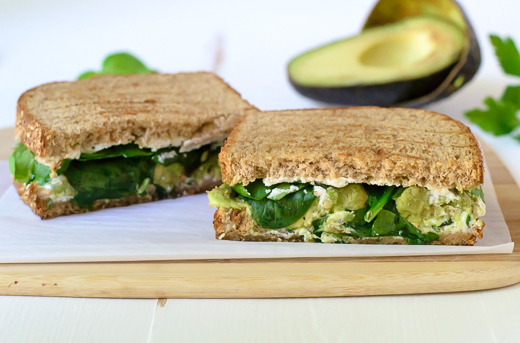 Keeping it light, fluffy and packed with flavor is key. Most tamale recipes call for water and no seasoning to the actual dough, and this is where I like to step in and kick it up a notch. I think adding a pinch of salt, or adobo seasoning, substituting a flavorful veggie or chicken stock for water and some lime zest to the dough sends this dish through the roof. For dessert tamales I will add some cinnamon and fresh vanilla bean to the dough. I have become a master at eating tamales, but making them is another story. Making tamales can be intimidating, and yes it takes a few tries to get into the groove, but I really encourage you to keep practicing. The beauty of a tamale is that even if you make a mistake or your tamale isn’t the prettiest to look at, they can still be darn delicious. With this recipe I wanted to do something fun and little different. I went completely vegan with it. My reasoning? To be honest, it was a Wednesday and I was feeling adventurous. Most people don’t think of having vegetables as an anchor to a dish but they absolutely can be. Vegetables have monster flavor, you just have to know how to coax that flavor out. Starting with a classic Latin soffrito as the base, I built my dish from there. 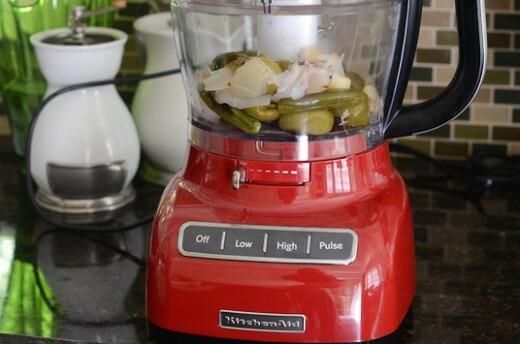 I used my KitchenAid® Food Processor to quickly chop the ingredients into a smooth paste. I took my puree and crisped it up until it was golden brown. After that I fried warm spices like cumin and chili powder to give the filling a hearty backbone. I added beans, grilled corn and kale for extra body and fiber and when I finished I ended up eating half the filling before I could stuff the tamales. SO GOOD! 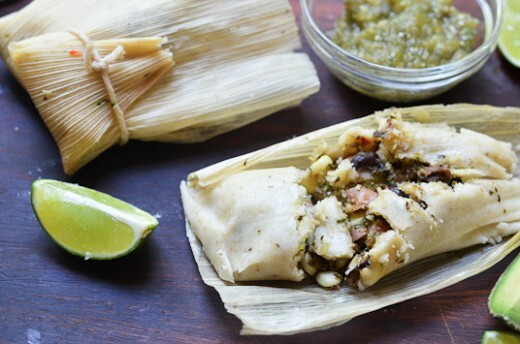 Any good tamale is complimented with a salsa, and my roasted tomatillo salsa is the perfect pairing for these vegan tamales. 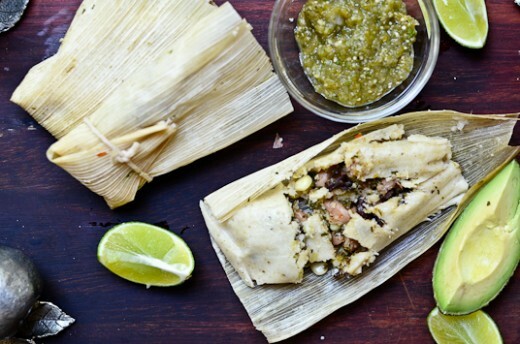 Tangy and smoky, the acidity cuts through the savory heartiness of the tamale. Again, using my KitchenAid® Food Processor I was able to just roast all of my ingredients and throw them in. Within seconds I had incredible salsa. I usually will make a double batch of this stuff because I end up putting it on everything from my eggs in the morning to grilled fish at night. 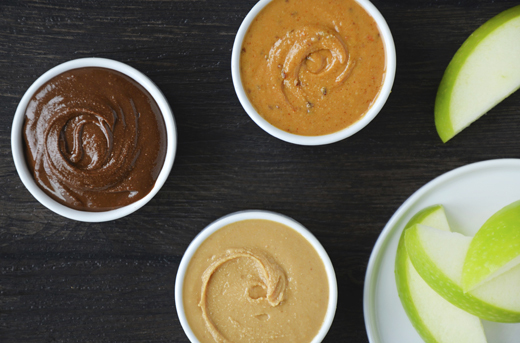 It is a fat free way to add a lot of flavor. 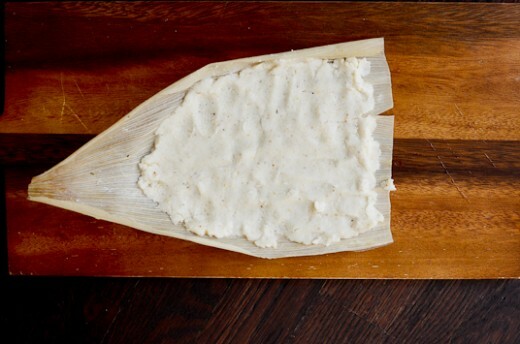 When building your tamales, you want to have a thin smooth layer of masa with some room at the top and bottom for folding. This is my best attempt. I am sure that there are a thousand abuelas ready to have my head, but hey, I am still a work in progress. At the end of it they were delicious tamales, and I had NO complaints. 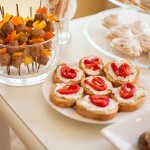 It all came together quickly, especially using the KitchenAid® Food Processor. A life saver for sure! I hope you will give these little rascals a try, they are well worth it. Surprise yourself, it’s so fun! *Maseca brand specifically for Tamales is great but if you can’t find that regular Masa Harina works too. Preheat broiler. 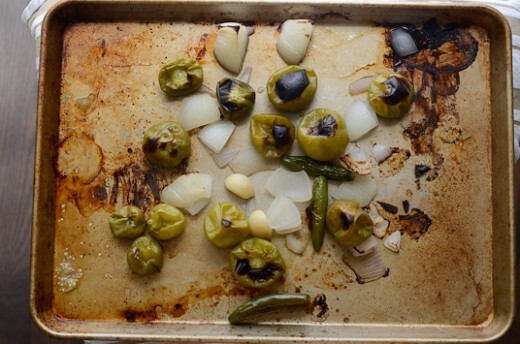 Place tomatillos, serranos, onion, and unpeeled garlic on a sheet pan. Place on highest rack in oven and broil for 7-10 minutes, or until the ingredients start to char. Remove from the oven. Peel garlic and remove the stems from the serranos. 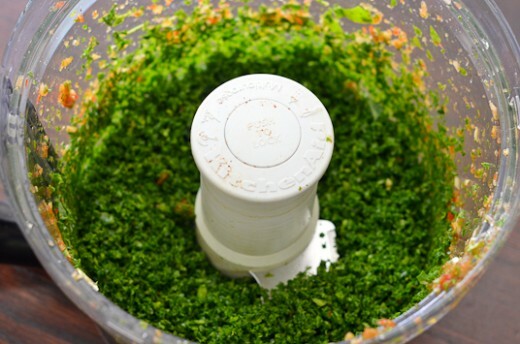 Place all broiled ingredients plus cilantro and salt into KitchenAid® Food Processor and blend on high until smooth. 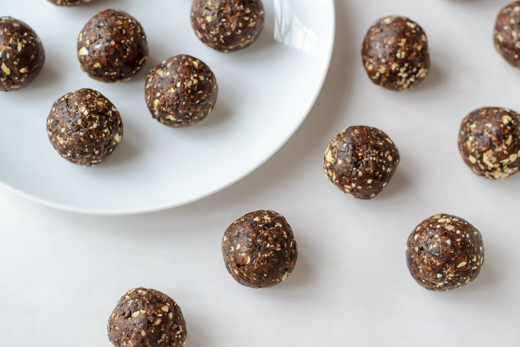 Pour into a small bowl and set aside. This can be done up to 3 days in advance. In a large bowl soak cornhusks in warm water. In another bowl combine the masa, water, baking powder, zest and salt. Mix until combined. In another bowl beat the shortening with a whisk until light and fluffy. 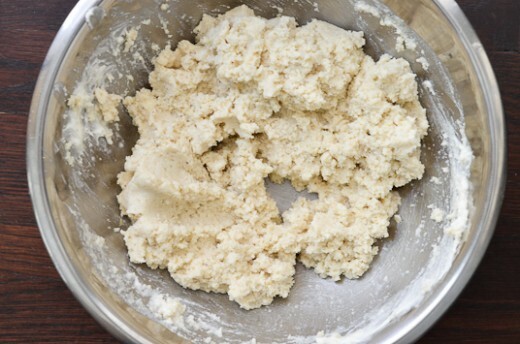 Add whipped shortening to the masa mixture and using your hands gently combine the two until incorporated. Wet a paper towel or dish towel and cover the masa. Set aside. 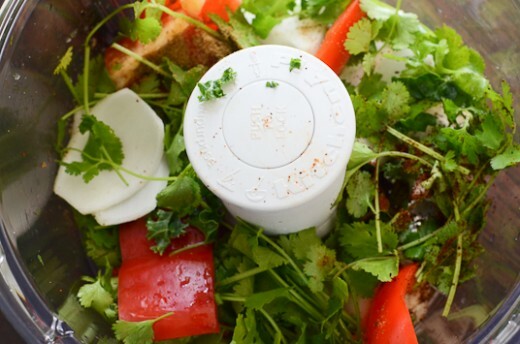 Place onion, garlic, cilantro, bell pepper, seranno, cumin, and chili in KitchenAid® Food Processor and turn on high until the ingredients are completely broken down. Heat a skillet over high heat and add 2 tablespoons oil. 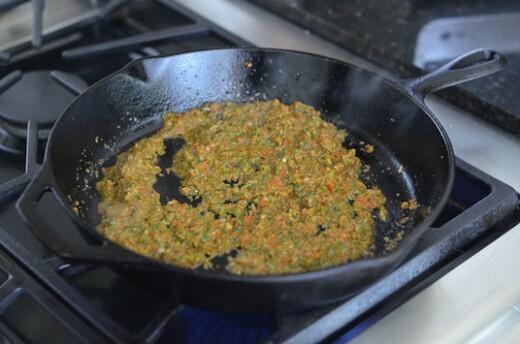 When oil is hot add your pureed veggie mix and “fry” over high heat for 2-3 minutes, stirring occasionally. While veggies are cooking, take the kale and add into KitchenAid® Food Processor and pulse until broken down into tiny pieces. Add the chopped kale to the veggies and continue to cook for 3-4 more minutes. In a bowl combine the pinto beans, black beans, corn kernels, and cooked veggie mixture. Set aside. Take soak cornhusk and lay flat on a clean surface. Spread the dough over the husk about ¼- ½ inch thickness making sure to leave ½ inch empty from the top and 2-3 inches from the bottom. Place 1-2 tablespoons of veggie filling in the center. Fold the sides of the husk into the center and fold the bottom. 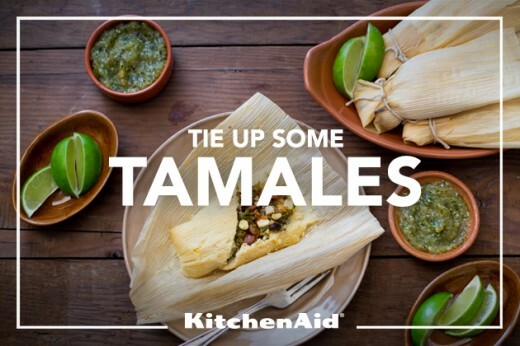 Secure the tamales with a piece of kitchen twine or peel a spare cornhusk into strips and use those to tie the tamale together. Place tamales in a steamer and steam for 1 hour. 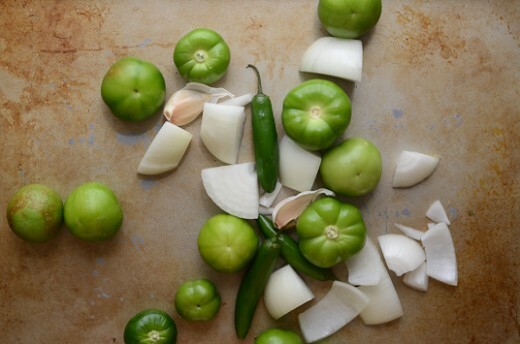 Unwrap and serve with Roasted Tomatillo Salsa.